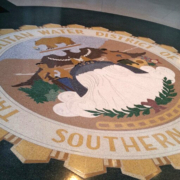 In a vote by the Metropolitan Water District of Southern California (MWD) Board of Directors, West Basin Municipal Water District (West Basin) Director Gloria D. Gray was elected to serve as chairwoman of the MWD board. Gray is the first African American woman in Metropolitan’s 90 -year history to hold the position and the first person of color to become chair. Gray replaces former chairman Randy Record, who held the position since May 2014.